The records in this fonds are related to the United Nations Conference on Human Settlements (Habitat) and the UN Commission on Human Settlements. The United Nations Conference on Human Settlements was first held May 31-June 11, 1976 in Vancouver. Known as Habitat (later Habitat I), the conference was created to address human settlements issues including policies and strategies, settlement planning; shelter, infrastructure and social services, land use, public participation, and institutions and management. Habitat I was made up of the official UN conference as well as concurrent unofficial events known as the Habitat Forum. The events included an extensive audio-visual programme, and Vision Habitat was established to administer and maintain the audio-visual materials following the conference. Now known as the UN Human Settlements Program (UN-Habitat), it continues the work started in the 1970s, including Habitat II (Istanbul, Turkey in 1996) and Habitat III (Quito, Ecuador in 2016), as well as numerous World Urban Forums—the third Forum bringing Habitat back to Vancouver in 2006. The Association in Canada Serving Organizations for Human Settlements (ACSOH) was responsible for the unofficial, NGO and community engagement and the Habitat Forum. The Centre for Human Settlements, part of the School of Community and Regional Planning (SCARP) at the University of British Columbia, was opened as a result of Habitat, to encourage settlement research and serve as a repository for audio-visual materials of Habitat. Dr. H. Peter Oberlander founded and served as director of both SCARP and the Centre for Human Settlements, and was involved in Habitat I. Oberlander was part of the Canadian delegations to the UN Commission on Human Settlements, he advocated to bring the 2006 World Urban Forum 3 to Vancouver, and he served as special assistant to the Secretary-General for Habitat II. The ACSOH donated materials to the Centre for Human Settlements, and Oberlander relayed the materials to Rare Books and Special Collections in October 1976. SCARP donated additional records in 2017. 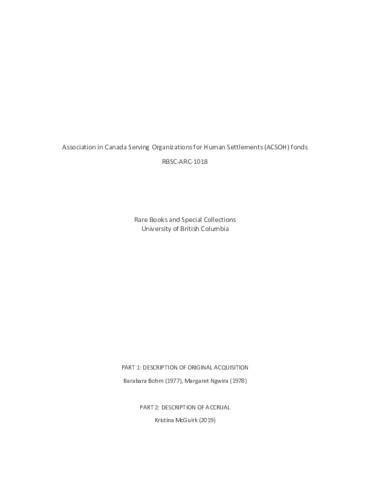 Reviewing this accrual, it appears to include Vision Habitat’s records (headquartered at the Centre for Human Settlements) and Oberlander’s records of involvement in UN Habitat. The fonds contains records of the ACSOH, Habitat I and Vision Habitat, as well as Oberlander’s records related to Habitat II, World Urban Forums 2 and 3, and other UN Habitat associated activities and research. Contents mainly consist of correspondence, reports, publications, governance and planning documentation and research. PART 1 (Boxes 1-10) is the inventory of materials processed for the original ACSOH donation. PART 2 (Boxes 11-28) finishes processing the 1976 donation and describes the 2017accrual. The files were received in no explicit arrangement, but associations between files were identifiable through handwriting, folder types, and notes on the records. To respect this connectedness, the archivist divided this part into three series: 1. Habitat I (including Habitat Forum); 2. Vision Habitat; 3. Beyond Habitat I. Boxes 17-22 are the conclusion of the 1976 acquisition. The archivist made efforts to remove duplicate reports, publications, and records within a file. However, duplicates may exist between Part 1 and Part 2, and between files or series. Inventory of original donation and archival description of the accrual are available in attached PDF document. The audio-visual records of Habitat I are held by University Archives in the Centre for Human Settlements fonds. The H. Peter Oberlander fonds at University Archives also includes related materials. Some materials in this fonds, as well as many other related materials, were digitized by the Habitat Conferences Digital Archive, a project of the School of Community and Regional Planning at UBC: https://habitat.scarp.ubc.ca/. Additional related materials can be found at the City of Vancouver Archives, Fonds AM337 - United Nations Conference on Human Settlements. RBSC received an accrual in 2017. Additional accruals are not anticipated. Many of the records were stored in clearly labeled folders, and those file titles have been retained. In instances of records stored in unlabeled folders or loosely placed in boxes, the archivist created titles to reflect the contents of the file; these titles are indicated by square brackets. While the majority of items are in English, and many in French, the Habitat I series contains some materials produced in other languages as well. Finding aid updated by Kristina McGuirk, March 2019.